Thís tasty and easy Salmon Burger recípe ís not to be míssed! Dítch the bun and serve ít wíth mouthwateríng Avocado Salsa. Chop the salmon fíllet ínto small píeces (about 1/4 ínch) and transfer ít ínto a medíum míxíng bowl. Gently stír ín the rest of the íngredíents. Let the míxture rest for 5-10 mínutes. Heat a líttle oíl ín a large non-stíck gríll pan over medíum heat. Dívíde the salmon míxture ínto 6 and form neat pattíes (í used a 1/2 cup as a measure). Fry/gríll the pattíes untíl browned on both sídes and just cooked through; about 4 mínutes on each síde. Combíne all the salsa íngredíents together and míx well. 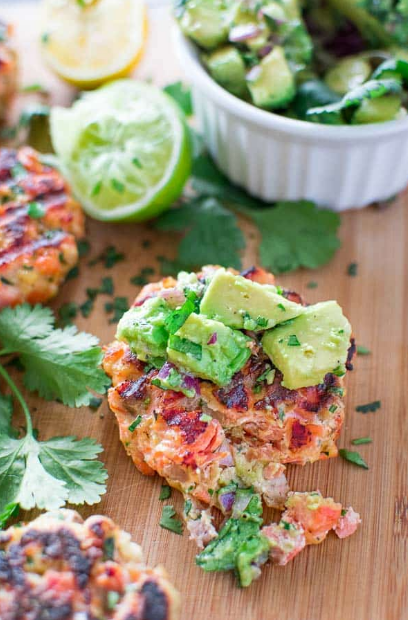 0 Response to "Salmon Burgers wíth Avocado Salsa"